gaetano donizetti | opera, innit? You ever imagine Tristan and Isolde with a happy ending? No? The French did (of course they did!) and so did the Italians, even more successfully. It was 1832 and women in opera had a few more years left to be intelligent, poke fun at hackneyed stories and crucially not die by the end. I bought this ticket wrongly and long before I knew how contralto-mad times would get. So let me make a belcanto pitstop before I get back to my German adventures. I missed this “much loved” production the last time it was aired but I caught it on the radio and kicked myself for missing it. This time I was determined to see it – but as cheap as possible. It was only after booking that I realised I got the second cast, at the time including Rolando Villazon. Though you might remember I got a bit googly eyed for Alexandra Kurzak during Il turco in Italia and was rather annoyed to miss her this year, I decided to see the glass half full and check rising star Pretty Yende out. At the weekend I (half enthusiastically) mentioned to Agathe that I would be seeing Villazon on Tuesday. Well, what with not being a Villazon aficionado I don’t know when the change happened but today I noticed his name was not part of the cast. I had no idea who Avetisyan was but he turned out to be a very welcome surprise. He’s a good singer, really looks the (dorky) part and has excellent comedic timing. In spite of the dorkiness, the man has serious stage presence. For my money he was the best actor tonight in a cast that was by no means shabby, continuously drawing laughs and not just because he had obviously learned his part (and stunts) very well. The man has a feel for the stage and is lucky to have caught our attention in such a carefully detailed production. His diction ain’t bad either. He does have to work on making his vocal performance more detailed, more personal, but I suppose that is the kind of thing that comes with experience. If he’s intelligent and has a good team to support him I think he will do very well in the future. Yende has more of a Netrebko-type voice than what I’d expect in an ideal belcantist. Though she can pull off the trills and the top seems to come easy at her age, I imagine she will soon grow into heavier roles. It’s always interesting “getting to know” a voice for the first time live. I’d heard some stuff on zetube and couldn’t quite make up my mind. Live I liked her soft singing best, which is genuinely warm with just enough roundness. A congenial voice. Her stage presence, in fact, is very girl-next-door (and she and Avetisyan made a very cute village couple). She sort of reminded me of Veronique Gens as Dona Elvira – a bit (or perhaps way) too nice for the role. At the beginning we need to be unsure of Adina’s feelings or to laugh with her at Nemorino. She’s the local landowner so she can’t be too chummy with Nemorino from the getgo. It might be part of the production but I felt Yende’s Adina was just another girl in the village, gently teasing Nemorino and getting girlishly sulky when he’s pretending not to care for her. Though her soft singing has quite a bit of character (the emotion came through), she tended to be more abstract in the coloratura and when deploying the very top – neither of which were unpleasant on the ear, mind. Maybe next time she convinces me that coloratura isn’t just there to wow the audience with pure technical skill. This is the kind of production where even the baddies are lovable. Bordogna was quite the bufoon as the self satisfied Sargent Belcore. It was the fourth time I’ve seen Esposito and by far the most pleasant. He must enjoy singing in an undershirt, as I think this is probably the third time I see him in one. It’s neither an opera nor a production interested in commenting on consumerism and public gullibility, so his Dulcamara is simply amusing, the way he keeps popping up and tying his magic potion to everything that works well. Dulcamara: hello everybody, I’m Dr Dulcamara and I came up with that magic potion that works on everything from bedbugs to constipation, you may have heard of it1. Villagers: ooooooooooh! Hello Dr Dulcamara, can we have some of that? Dulcamara: of course! It’s cheap too. And it can make you great in bed and rich at the same time, like Nemorino here! Villagers: OMG, how did we live without it all this time?! Pelly productions always have extra little somethings, and here the curtain at intermission was a giant Dulcamara advert (in Italian, which made it even funnier), with pictures and text describing various ailments cured by the miraculous drug (you can see pictures here). De Billy and Co. did a reasonably good job. Maybe it’s my seat (horseshoe left), maybe it’s my ears, but I felt like the sound from the orchestra was particularly uniform. The flute, oboe, bassoon and harp did their job when called for solos and/or lead, with the flute faring best, though nothing to write home about. I can’t say maestro made any efforts to pick out interesting sounds from his team. 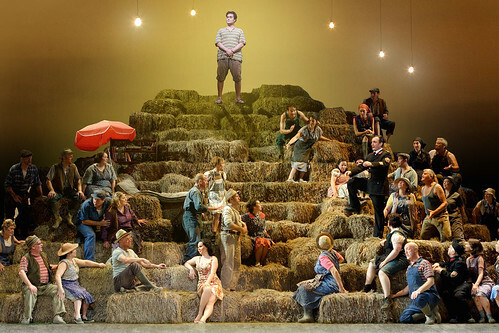 Likewise the chorus, who had quite a bit to do on stage – the villagers are very present in the opera. They sounded solid and on time but aside from one instance when the male side of the chorus sprung up quite nicely they seemed satisfied with merely keeping to the rhythm. The whole thing (orchestra included) could’ve benefited from more rubato. Belcanto comedy is built on simple, hummable tunes which can sound very mechanical without a bit of imagination. The audience loved it, laughed a lot, clapped a lot and gave the team a very warm reception. It’s a likable production, I can’t complain. The atmosphere was congenial, with my seatmates on the left jolly and relaxed as well as knowledgeable, and my seatmate on the other side not particularly knowledgeable but certainly friendly and enjoying herself. It’s great to see Londoners letting their hair down at times like these. Patriarchy: Marry some dude you never met for the sake of the family, Lucia! Lucia: But I’m in love with someone else! Patriarchy: It’s ok if you don’t love him, focus on the fact that your brother is in trouble [because of bad political decisions]. Lucia: I promised I will marry someone else! Patriarchy: Oh, a marital promise not blessed by a priest doesn’t matter. Lucia: I don’t want to marry someone just because my brother is inept at politics! Partiarchy: Shush, adults are speaking! 1) This libretto is what caused Feminism to erupt into the world, folks. Ok, not literally but OMG. There are no words. 2) Have you ever laughed when watching Lucia? Well, this production gave us unexpected opportunities (yes, more than one). There is a Live Cinema relay on 25 April, which may or may not be the reason why there were cameras today and will be again on 19 April. If there is a DVD so much the better, because humorous Lucia should be immortalised. The harp sounded very fine in its solo. Also the glass harmonica worked nicely in tandem with Lucia. I think belcanto was served well through the evening, though it’s the kind of thing where you come for the singers – and the choir, that meddling belcanto choir we love from Bellini, Rossini and recently Mayr. eh, not Lucia?! Pretty damn fitting poster, though! The thing with this production is that there are many scene changes that for me felt quite disruptive, especially the one before the very last scene. Lucia has sung her long, complicated, famous bit and that’s when we get a break. Poor Edgardo, who cares anymore? At least he gets to slit his throat rather dramatically. Otherwise, the brouhaha about woo, gory! seems to have been pure hype, and not the best kind, as some people have shied away. A few pints of blood were shed but no actions we haven’t seen on crime shows for the past 20 years. The stage was split in two, which I thought worked well in showing what the other characters were doing whilst somebody was singing. The only problem was that sometimes what the other characters were doing distracted from those who were singing. The worst hit was the Enrico/Edgardo duet, which was set during the time Lucia and her mezzo maid wrestled with and killed Arturo. Because, you see, after Lucia – quite clumsily – stabs Arturo, the chap stays put for like 2min after which he bolts upright and tries to make it for the door. And he wasn’t even singing! The audience in my area was consumed with laughter. Not so fast, tiger, says the mezzo maid, and shoves him to the floor (mezzos are always resorceful). Lucia faffs a bit but then stabs him in the side. He writhes, they keep him down, Lucia brings a rock but is about to pass out rather than bash his head in. All this time Enrico and Edgardo are singing their hearts out and I bet you no one – outside of diehard Castronovo fans – was looking their way. Another hilarious moment – which, to be fair, had everything to do with the libretto – was during the wedding reception, when Lucia – looking lalalala – is coming into the hall. Enrico: If Lucia looks a bit unhappy, it’s only because of her mother’s recent death. Enrico: Oh, yea, but this has absolutely nothing to do with it! Edgardo: OMG! You slag! How COULD you? You said you loved me etc. Lucia: Well, guess what buddy, I was surrounded by my personality disorder(ed) brother, the entire (menacing) male chorus, an ambivalent cleric and not one but two ghosts and now you ask me how could I? Give a bloody girl a break, willya? Jesus. She doesn’t actually say any of this, but she oughta. She should’ve also packed her suitcase a la Aix Ginevra and left that lot to their petty duels. But then she’d’ve got a bravura aria rather than a glass harmonica, ornament city mad scene. I mean that mad scene has every combination of ornament known to man (and, in this case, woman). The good news is Damrau can pull it off. She needed a bit of warmup in act I but by this point her top was working flawlessly. She’s also an intelligent singer and the ornaments have a logical basis. What Damrau lacks is a sense of otherworldliness. She’s a very flesh and blood Lucia, which works well for the most part. You really don’t feel she’s a helpless victim and the dramatic arc is very coherent, from the beginning when she and mezzo maid dress in male attire to meet up with Edgardo by the Fountain of Doom where they have very explicit sex1 (sadly, the maid is not involved). This Lucia is a woman ahead of her time and Damrau is the right kind of actress to portray that. But traditionally Lucia is an emotionally unstable woman – right from the Fountain of Doom scene she’s seeing ghosts – and quite a few Lucias go for weirdness in their mad scene (Gruberova stands out for me as a particularly weird one). No so Damrau. She’s playful and happy in a very non-psychotic-looking way. I like the strong woman approach but I admit I missed the oddness. But let’s go back to the Fountain of Doom scene. It’s apparently the fountain where an ancestor of Edgardo’s had stabbed the woman he loved, which is an odd spot for Edgardo to meet the woman he loves. Then again, his last name is Ravenswood, so he’s strong with the spooky. Lucia knows the legend, has thought about it and has brought a small bouquet to lay down in memory of that unfortunate woman. Next it’s morning in Lucia’s bedroom and oops, she has morning sickness. That’s your proof that talking about revenge ups one’s virility. She miscarries whilst/from killing Arturo but she will sing her mad scene. But enough about the production. This evening was the third time the charm with Castronovo and I got to hear Tézier, about whom I was just saying the other day that I knew I had to hear him but I wasn’t sure why. Well, he more than held his own. He made for an unpleasant Enrico and sounded good (though not quite great) whilst doing so. Castronovo, though, was a bit of a letdown. I had seen that webcast of concert Lucia with Damrau and Calleja from – from where? one or two years back – and I remember liking Calleja better. What I mean is I felt that Castronovo’s darker tone got in the way. I was expecting more colour/variation in sound. His ppps sounded a bit funny, too, sort of flat rather than ppp proper. Maybe I’m wrong in my description but the sound seemed bent instead of diminished in volume. Also at some point Edgardo sings together with something like a continuo and the two were not perfectly synchronised. Other than that he was fine, rather good chemistry with Damrau. Maybe I need to hear him in something else. Kwangchul Youn (as the ambivalent, Lorenzo-like priest) was another singer I had wanted to hear. He has a beautiful, expansive tone but I questioned his legato in the lovely Infelice! della mente/La virtude a lei mancò! Maybe Maestro wanted him to go rhythmical but I wasn’t quite won over. It was a surprisingly mirthful evening. I also had a very chatty seatmate, we somehow veered into politics and managed to “stay friends” 😉 He first asked me who was my favourite soprano which proved easy enough to answer but then he asked who was my favourite tenor. I totally blanked out, I couldn’t come up with any name aside from JK 😉 I ended up saying I liked mezzos better than tenors which is both true and says it all though I don’t think he got it. Generally the audience was very congenial and, as I said, with an unexpected sense of humour – you (I) sometimes imagine belcanto fans as these diehard romantics who keep to themselves and sigh at the moon Werther-style. I think the lady next to me (who fit that description) sobbed a bit during the Lucia/Edgardo bits. She also had a very loudly ticking watch (!) which initially worried me, as the seconds ticking away were a continuo accompaniment to the music – but then I either got used to the ticking or the people around me were laughing too hard. Kidding, actually during Lucia’s mad scene you could hear a pin drop. Conclusion: this Lucia was mad but in the pissed off kind of way. I don’t object at all to this production because the libretto is kicking it so jawdroppingly old skool (for anyone 200 years removed from traditional culture; I am aware people still marry for social/policial reasons but I can’t get over it). I think going about this your emotions don’t count thing like it’s nothing is much worse than unintentional comedy. ROH 2016-2017 confirmed, let’s talk! Shagimuratova, then. I won’t be expecting complex characterisation, just very precise singing in an alluring voice, which is what people seem to endlessly equate Aspasia with (super difficult singing – yea, but so what?). Don’t know Anett Frisch but Spyres and Mehta are (same old) known quantities in their respective roles. Excuse me while I stand bitterly disappointed after the definitive-looking Paris production. Doesn’t mean I won’t go see it for Mozart. Conducted by Byckhov, of all people! I loved his Die Frau ohne Schatten, what will he do here? Brower is known to me as the multitalented Annio from the circus/cult Tito (Munich) production. The one with unicorn hair 😉 and the lovely tone, who accompanied himself for the Act II intro recit with Sesto. Will they have her do something out of the ordinary here as well? We have dates for Adriana Lecouvreur (7 February–2 March 2017), woohoo! Must start saving now (sigh). I have never heard of the alternative soprano. But yay Finley as Michonnet! New production by Carsen but apparently it’s the one from Salzburg? Or something. Anyway, it’s the ‘kavalier, I’m going no matter who’s in it (within reason and mostly depending on Octavian. I’d like a more adventurous choice for Die Marschallin but, hey, big house. And if it‘s the one time I’m seeing Fleming live this is probably the best bet). Speaking of other choices, has Catherine Naglestad ever sung Die Marschallin? I know she won’t be putting bums on seats in the way Fleming does (because the world is funny like that) but I’m having a bit of a Naglestad fest in my little world and I thought her Salome was way fine. And you might remember that semi-legendary (but severely cut) Alcina with Naglestad and Coote (daydream moment). She’s agile but I’m not wowed by that voice. Too big too full too early? Not enough lyric quality. I guess Rossini fits her best out of that medley. She’ll be throwing babies into the fire before you know it. But it’s Kurzak and hubby1 (cheers, no Villazón for me, though I would like to hear Yende) and enough with the Esposito, I bet he’ll make Dulcamara all menacing and whatnot. Eh. It’s a bloody comedy. Anyway, Kurzak! Conducted by “my homie” Evelino Pidò. I recently had a weird moment with Hoffmann: I felt like it would be something I could sing. Not as in I can actually sing it, because I can’t even “actually sing” Row, row, row your boat, rather I could easily get into the spirit/rhythm/chord progression/Frenchness of it. A bit weird – French opera, of all things. Ok, let’s see Kate Lindsey in something she’s properly well known for. There’s a shitload of big names in it = more saving, and Yurchuk as well, lovely tone ex-Young ROH Squad baritone. You know I said I was going to go although I thought the music was unbearable because I’m a not so secret Gogol fan. Also Rosie Aldridge is in it and I really liked her in local Monteverdi and Handel. This is neither, I know, but I’m (and will be) very happy to see her on a big stage. Ok, I want to hear Kelsey live so that settles it – though I liked Tsymbalyuk’s Commendatore and I’d like to hear Haroutounian just because her name is badass… but twice with the pirotechnic babies? A bit much. Good chance to hear Stoyanova and Tézier (don’t know why I should hear him other than his name has been around for a while), also Abdrazakov (tongue twister ftw!). Heard Semenchuk’s Eboli on zetube, wasn’t that impressed. Maybe she’ll be better this time around. Thomas Adès conducts a huge ensemble cast of world-class singers in the UK premiere of his latest opera, inspired by Luis Buñuel’s iconic film. Look at the fine cast but ugh, Buñuel? I don’t know, I’m really unfamiliar with Adès. See the opera stars of tomorrow in a blackly comic production of Handel’s masterful pasticcio, in the atmospheric setting of Wilton’s Music Hall. Whoa, look! ROH has sort of caught on to the Baroque craze for its young singers. Sounds like it could be fun. More chance to hear Shibambu’s deep bass voice and let’s see if these yougins measure up to our local baroque talent. Francesca Chiejina and Thomas Atkins perform art songs, accompanied by David Gowland. Francesca Chiejina was the young and very promising soprano who made an impression in JDD’s Masterclass at Guildhall last year. Worth checking her out in recital. …and of course there are other things that I am not interested in, though I may go see Barbara Hannigan in Written on Skin in a somewhat similar way I’ll put up with Otello for Röschmann. Indeed, I first came across her as dreamboat Servilia in the famous Paris “Potato” production of Tito. I looked up her Askonas Holt profile and it seems a Morgana and a Cleopatra are the works. Bring them on, I say. Temperamentally Siurina and Gomes are very different. He earnest and impetuous, she playful and cute as a button. If he came into his own with Che gelida manina, for which he has the passion and Italianate tone, her most memorable point before the interval was Rossini’s La pastorella dell’Alpi. 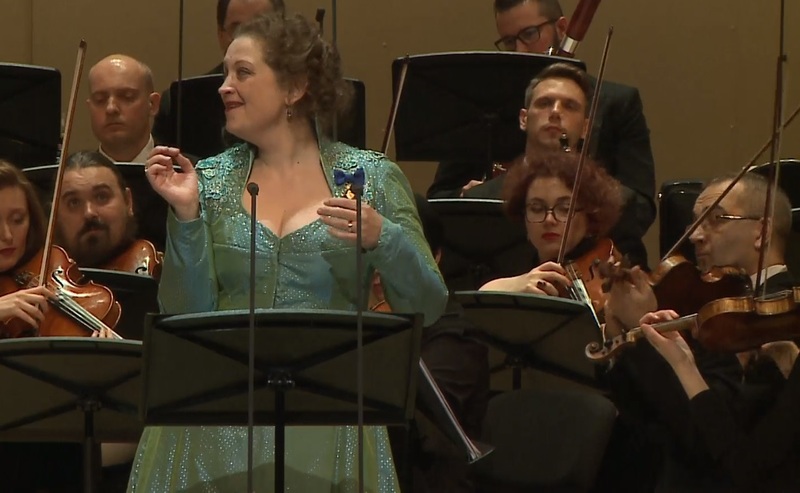 Siurina’s gift for comedy and witty phrasing of the (very silly) coloratura were pure delight. In terms of skill it was hard not to notice Gomes was the junior partner in this joint. Both of them have large enough voices to make your ears ring even when sat at the back of the hall. Driven by youthful enthusiasm, Gomes took every opportunity to soar as Italian tenor in full cry. There’s no doubt this is his path, a path that allows a good deal of shouting, but when he chose to sing one of the Russian songs entirely below full power it wasn’t unpleasant at all. A bit of variation in volume dynamics is a good thing even for his preferred repertoire. When in duets the both of them turned up the volume to the max the sounds became harder to distinguish, let alone the words. That’s a shame, because he has a beautiful, manly tone up and down the range which we want to hear and bask into. For her part, Siurina showed a variety of dynamic approaches. Though not a small voice, hers it’s remarkably vibrato-less and still wonderfully flexible. I’m not sure whether the Russian songs were more uplifting than usual or it’s just her light hearted personality as she breezed through them. I’d say she doesn’t sound like the typical Russian soprano. In the Italian songs she balanced between a “relaxed” manner and a full on operatic one, which I thought was rather interesting and reminded me of Antonacci’s way of singing them. Burnside accompanied but I have to say between each of the singers’ pizzazz I lost him. In any case, this was an interesting break into my Handel-fest. Will definitely make time for Siurina’s recitals in the future and perhaps I’ll catch Gomes when I venture into his repertoire.